Friday November 13th 1903 Bird took me down town to see about my Collarette. We came back in a snow storm. Spent the afternoon visiting. I walked down town before supper to change Robs slippers. Spent the evening talking with the girls. Saturday November 14th 1903 I took a walk up to Shultz and back to see about my collarette. Soon after dinner Birdie took me down to the depot to go to Carthage. I got there at dark Mr Cotter met me. spent the evening visiting. Sunday November 15th 1903 I talked with Mrs Talbut while Ida went to S.S. Mr Cotter took me to church. The afternoon was spent in visiting and reading. We went to church in the evening. weather indicting a storm. 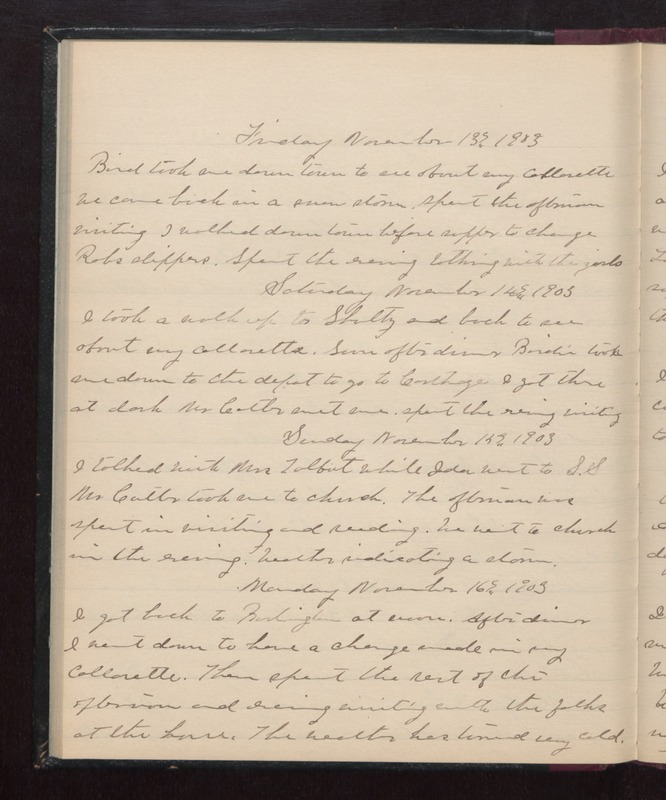 Monday November 16th 1893 I got back to Burlington at noon. After dinner I went down to have a change made in my collarette. Then spent the rest of the afternoon and evening visiting withe the folks at the house. The weather had turned very cold.